Antisemitic stereotypes are alive and well in Europe, according to a new CNN poll. The poll, which was conducted in seven central European countries and in which thousands of people took part, found that more than a quarter of Europeans believe that Jews have too much influence on business and finance. Almost one in four Europeans says that Jews also have too much influence on areas of conflict and war around the world. One in five says they have too much influence on the media, and a similar percentage believes they have too much influence on politics. At the same time, a third of the Europeans who participated in the survey admitted that they knew little or nothing at all about the Holocaust. 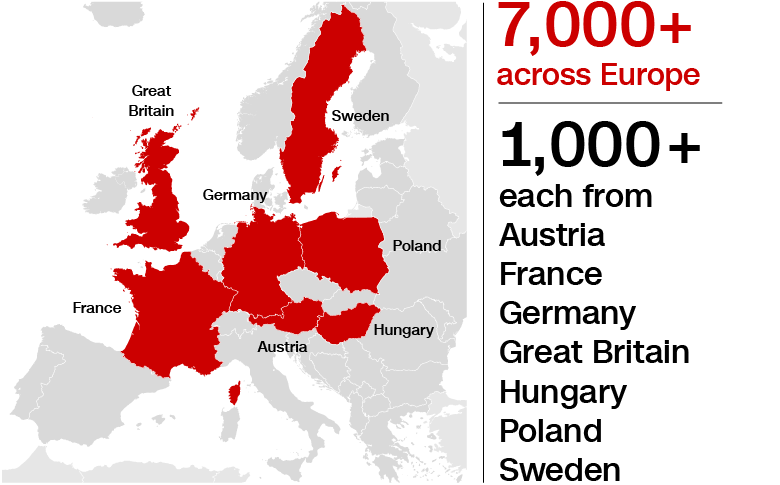 The poll, conducted by ComRes for CNN, surveyed 7,092 people from across Europe, with more than 1,000 polled in Austria, France, Germany, Britain, Hungary, Poland, and Sweden. The survey was commissioned and completed in September, before the murder of 11 people in the massacre at the Tree of Life Synagogue in Pittsburgh. The poll found that one in 20 Europeans has never heard of the Holocaust. Ignorance about the Holocaust is especially evident among young people from France: One in five between the age of 18 to 34 in that country said they had never heard of the Holocaust. At the same time, the Europeans said they believe that it is very important to preserve the memory of the Holocaust: Two-thirds of respondents said that perpetuating the Holocaust helps ensure that such atrocities never happen again. Half of Europeans said that Holocaust commemoration is helping fight antisemitism today. On the other hand, a third of Europeans claim Jews use the Holocaust to promote their positions and goals. The poll also dealt with the issue of the relationship between the Holocaust, the State of Israel, Jews and antisemitism. A small but stable majority of Europeans, 54 percent, said Israel had a right to exist as a Jewish state. A third of the respondents believe that criticism of Israel is motivated by antisemitism, and only one in five believes that this is not the case. At the same time, one-third of the participants in the survey, and half of those polled in Poland, said that Israel is exploiting the Holocaust to justify its actions. Only one in five objected to this statement. A third of the Europeans claimed that commemorating the Holocaust distracts from other horrors that are taking place today. In Germany, Austria, Poland and Hungary, the number of those who believed this was above average. While many said antisemitism was a growing problem in their countries, so much so that 40 percent said Jews were in danger because of racist violence in their countries, and 50 percent said their governments should do more to combat antisemitism, some claimed that the Jews themselves are at fault for the antisemitism towards them. More than a quarter of the respondents, 28 percent, said that most of the manifestations of antisemitism in their countries come in response to Israel’s actions. Almost one in five, 18 percent, said that antisemitism in their countries was in response to the daily behavior of the Jews themselves. Few respondents said they themselves have an unfavorable view of Jews. In the seven countries surveyed, one out of 10 respondents admitted this. This number rose to 15 percent in Poland and 19 percent in Hungary. In each of the countries surveyed, with the exception of Hungary, a clear and significant majority of respondents said they had a positive opinion of Jews. Despite the relatively low number of Europeans who openly admitted that they held negative views of Jews, the CNN poll also posed questions about antisemitic stereotypes and examined whether these stereotypes still resonated throughout the continent, finding that this is indeed the case. About four out of 10 respondents in Poland and Hungary said that Jews had too much influence on the business and financial world. About one out of every three respondents in these countries said Jews had too much influence on world politics, and more than a quarter said they had too much influence on the media. A third of the Austrians said Jews had too much influence on the financial world, while in France and Germany this was the opinion of a quarter of the respondents. One in five in all three countries said Jews had too much influence on the media, and a quarter said they had too much influence in conflict and war zones. The results of the poll will be presented in a special program that will air on CNN Internationalthis coming Friday.